No idea why it's taken so long to get this back up online again, but time flies when you have a gun. 45 tracks for you to download and stuff into your ears. Today on Eurogamer there's an interview with a bunch of the old Free Rad people on it's demise... it's been another sad day for me reading it and having to remember annus horribilis of 2008. As I'm such a massive big head...a massive head? I've decided to put the whole blurb I answered for the article here.. and try and move on with nicer things. There are many positive things in this industry, and although as with everything in the media, no news is good news, sometimes our opinion can be skewed by reporting. For the most part, Free Radical was an incredibly happy and creative period of my life. The following outlines some of the less good times. 1. You were one of five folk to leave Rare in early 1999 to make up the new Free Radical Design. Why? Why did I leave Rare or why did I set up Free Radical Design ? firm decision to stay and make a go of it and fate dealt an impressive hand that day and completely switched my decision. Perfect Dark was highly anticipated. We (as in the five folks) had the bargaining power to open doors and cheque books. 2. Did you get to build your dream studio as part of the deal? Unless my idea of a dream studio was sharing a cramped room with 9 other guys in the blistering heat without A/C... then yes, it was all I ever wanted and more. We moved offices 6 months later, and things slightly improved some what. advance on ridiculous cars and gold offices. 3. I visited Free Radical when they were in Sandiacre – I remember it being pretty high tech, and noting the presence of fresh fruit (still not very common in developers' offices). What was it like as a working environment? family environment to such a huge outfit but it was a joy to work at. So many creative and talented people under one (or four) roof. 4. 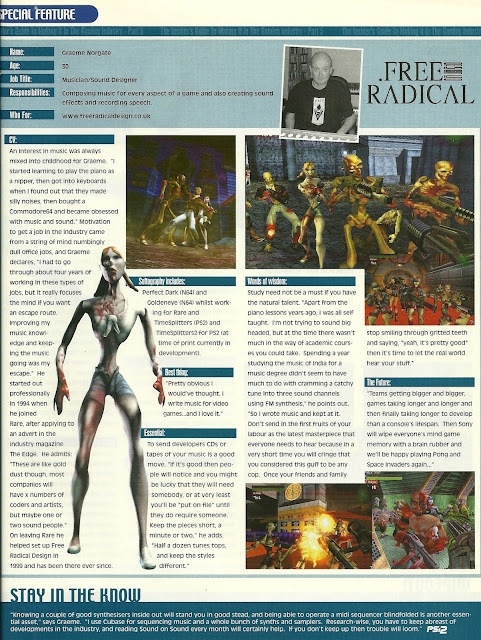 From April '99 to the release of the first Timesplitters was a year and a half – what can you remember about that time? Was it all about hitting the PS2 launch from the start? 5. Timesplitters 2 – the character R-107. Clearly a Kraftwerk tribute, anything to do with you? Not guilty. That would be from the mind of Ben Newman. Although for TS:FP I did translate the first line from Kraftwerk's Robots for his pick animation. 6. The years of Timesplitters and Second Sight saw FR scoring commercially and critically with every release, and the studio steadily increasing in size. You were being nominated for BAFTAs, lauded as one of Britain's big upcoming tech companies, and making great stuff. What was it like to be a part of something like that? but if you don't do that, you'll never improve and there is no time for resting on laurels in the video games industry, you've got to be constantly moving and improving. Looking back though from a purely selfish point of view, I am incredibly proud to have been nominated for Bafta's for TS2... even though I didn't win haha. 7. The feel of Second Sight was something new for FR, and I adore the eerie score you came up with. Everything about it is different – was this a consequence of the material, or was it more about seeing what freaky distortions you could tease out of synths? What can I say, I like the dark stuff! Second Sight was perfect for me from a scoring point of view. I wanted to make playing the game feel like watching the Shining. 8. Haze is missing lots of stuff that was intended to be in it. From the outside, with the switch from cross-platform to PS3 exclusive and the development delay, it looks like a pretty chaotic development. What was it like on the inside? effects than we could even dream of in Haze.... too little too late unfortunately. 9. Everyone's seen the footage of an incredible looking Battlefront 3 that FR were working on. I've been told that Lucasarts dropped it because Rebellion gave them a cheaper quote (which they couldn't deliver on). What do you remember of this time? Is that something you'd ever experienced before in the industry? 10. It is generally thought that the poor reception of Haze did for Free Radical. Would it be more accurate to say that it was losing the Battlefront 3 contract? free work to pass on to Rebellion wasn't to be sniffed at. Lucas Arts had gone through some restructuring and we were told that, they had suffered, now it was our turn. 11. The news of administration came as a surprise, and I recall on the morning of it FR staff turned up to a locked office – clearly the company knew it was in a tough spot, but was the decision to enter administration its own or forced? in... illegal but not uncommon according to our administrators who then have to pick up the pieces. We did it by the book and everyone involved had one of the shitest Christmases ever. They made some nice games then it all got a bit hazy.